If you live in New York City, you might know about a flower shop that’s a bit out of the ordinary. It’s a special spot that allows one to grab some pretty flowers for the house and then grab a drink. The place is called Sycamore, and it’s a fun destination in Brooklyn where you can choose the right flowers for any occasion and then celebrate your purchase with just the right cocktail. If you’re not from NYC, but will be visiting, make a point to hit up Sycamore Bar and Flower Shop. We think you’ll love it as much as we do. Sycamore Bar and Flower Shop opened in 2008. From the beginning, the space has been somewhere to which New Yorkers could turn for a bit of beauty and a lot of comfort (the bar’s drinks are perfect for warming the body on a chilly NYC evening). Sycamore’s bar offers yummy libations that are great for indulging in after a long day at work. Its flower shop sells non-traditional bouquets and arrangements, made with flowers that the owner gets in fresh every day. The folks behind Sycamore work with farmers in New Jersey, Connecticut, and NYC to bring in amazing blooms for your pleasure. They source many of their flowers from Brooklyn Grange, which has a rooftop garden with incredible floral abundance. In addition to welcoming in locals and tourists to buy flowers, and have a spirit, Sycamore gives away tips on how to keep cut flowers fresh. 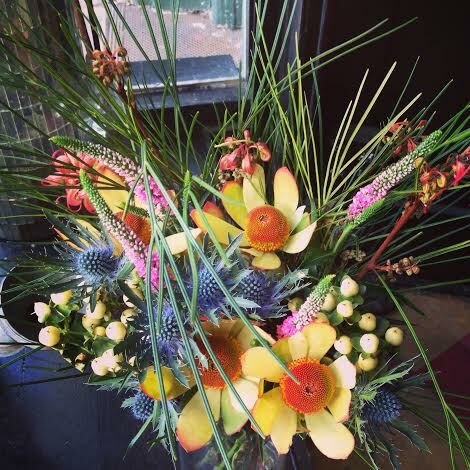 The next time you’re roaming Brooklyn, consider stopping into Sycamore Bar and Flower Shop! Their address is 1118 Cortelyou Road. If you do visit, drop back by here and let us know what you bought! If you live in New York City, you might know about a flower shop that’s a bit out of the ordinary. It’s a special spot that allows one to grab some pretty flowers for the house and then grab a drink. The place is called Sycamore, and it’s a fun destination in Brooklyn where you can choose the right flowers for any occasion and then celebrate your purchase with just the right cocktail. If you’re not from NYC, but will be visiting, make a point to hit up Sycamore Bar and Flower Shop. We think you’ll love it as much as we do.